This contest is over. Winners will be posted soon. 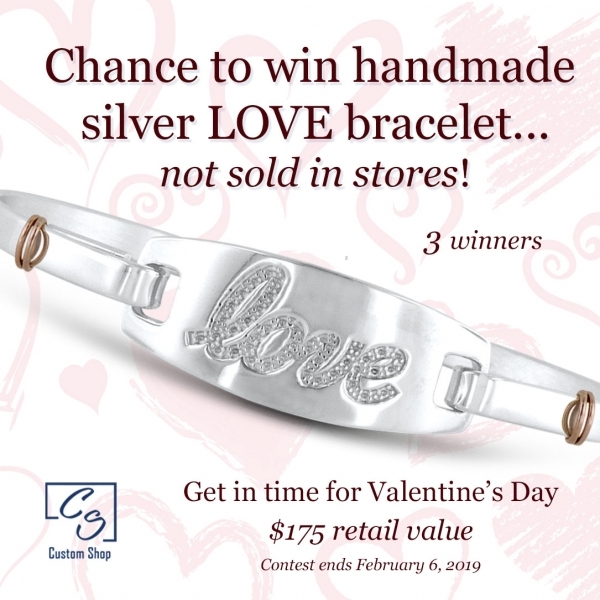 Get a chance to win Custom Shop’s silver handmade LOVE bracelet. Featuring 14kt solid rose gold accents, the LOVE bracelet has a retail value of $175. It’s also not available in stores. To participate, all you have to do is earn points by following our simple social media sharing list featured below. The more sharing options you complete – the more points you earn. The three top participants with the most points win (i.e. three winners chosen). Remember to like and share as much as possible! But hurry! Contest ends February 6, 2019 at 5:00 PM EST. No purchase necessary. Must be 19 or older and a United States resident. See official rules below for more information. Prizes will be delivered before February 14, 2019. Even if you miss Custom Shop’s silver handmade LOVE bracelet contest, check the Custom Shop Instagram account often. Custom Shop runs contests regularly. What is Novell’s Custom Shop?